Flip a coin. 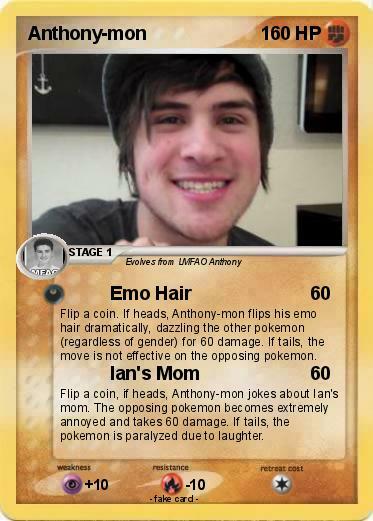 If heads, Anthony-mon flips his emo hair dramatically, dazzling the other pokemon (regardless of gender) for 60 damage. If tails, the move is not effective on the opposing pokemon. Flip a coin, if heads, Anthony-mon jokes about Ian's mom. The opposing pokemon becomes extremely annoyed and takes 60 damage. If tails, the pokemon is paralyzed due to laughter.